A delicious meal prepared by a band of village ladies. Why not come and join us for a natter... and some custard! 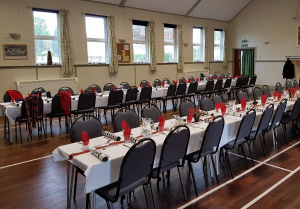 The hall, laid out for the ever popular Christmas Lunch attended by 60 residents of Ditcheat and outlying villages.